Hoyt Lucas pedals his unicycle in a recent Bryson City Christmas parade. Since the 1970s, the town has celebrated the Christmas season with a parade, and on Saturday December 10*, the 37th annual edition will circle through town with floats, fire trucks, bands, classic cars, beauty queens and lots of candy for the kids. The parade begins at 2 pm, and later at 6 pm, Santa and Mrs. Claus will be at the Train Depot for visits and photos. The evening concludes with a candlelit walk through town singing carols prior to the lighting of the tree on the square. 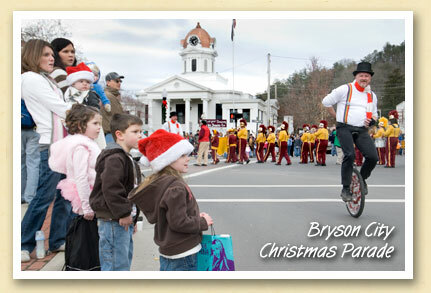 There’s a lot more about “A Bryson City Christmas” on our website. NOTE NEW DATE: The Parade date has changed from the 3rd to the 10th to show support for our own Swain County High School Maroon Devils playing in the State Championship game on December 3.